Ah, Sunday. A great day for just sitting back, relaxing and enjoying a leisurely meal. What better way to do it than to treat yourself to a Sunday brunch buffet in Bangkok? Anyone visiting or living in Bangkok is spoilt for choice when it comes to Sunday brunch buffet. There’s a tremendous number of options at hotels and restaurants, and with a wide range of settings to match just about any mood. Whether you’re on a date, meeting up with foodie friends or gathering with family, there’s a buffet somewhere in town to make your Sunday brunch buffet in Bangkok a delightful experience. Whatever your dining party, Sunday brunch buffet in a Bangkok hotel near a BTS SkyTrain station will always be convenient. 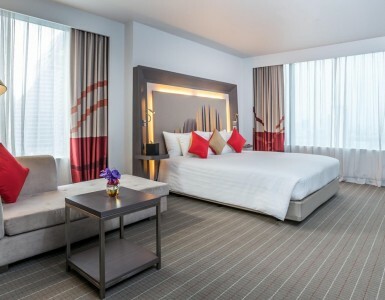 And highly convenient The SQUARE restaurant at Novotel Bangkok Ploenchit Sukhumvit is, since the hotel is directly adjacent BTS SkyTrain – Ploenchit Station. But to be a perfect Sunday brunch buffet in Bangkok, a spread has to be more than convenient. It has to be delicious. You’re guaranteed to find one of Bangkok’s most outstanding international buffets at Novotel Bangkok Ploenchit Sukhumvit. Highlights include premium seafood delicacies on ice or grilled over charcoal flame including, Alaska king crab, mussels, oysters and blue crab. 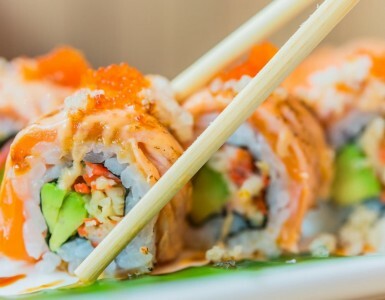 European dishes include foie gras, pasta with sauce, and cheese and cold cuts, while among Asian cuisines are Japanese sushi and sashimi as well as Indian curries and many Thai favourites. Scrumptious desserts await as well like the buffet’s tempting DIY chocolate fountain, crêpes, ice cream, cakes, Thai sweets and fresh tropical fruits. Sunday brunch is perfect for kids too: the little ones have their very own buffet line including special desserts and a play room. Make it a perfect Sunday brunch buffet in Bangkok at The SQUARE, Novotel Bangkok Ploenchit Sukhumvit.